You know why they call ‘em Squeenix? Because squeeee, you can catch up on the last two years of Tomb Raider for a tenner right now. That’s correct: the longtime publisher nickname has been building to a pretty decent discount all this time. Don’t look at me like that. They’re good games. Buy Lara Croft and the Temple of Osiris from the Square Enix Store, where it’s currently £9.99, and you’ll get a copy of 2013’s Tomb Raider and all. “This truly is a Tomb Saver,” write the publishers. Groooooan. Affectionate nickname revoked. In Temple of Osiris, Lara has to join forces with fellow treasure hunter Carter Bell and, more improbably, the shackled manifestations of ancient Egyptian gods Horus and Isis – all for the greater good of taking down Set, the one with the donkey head. 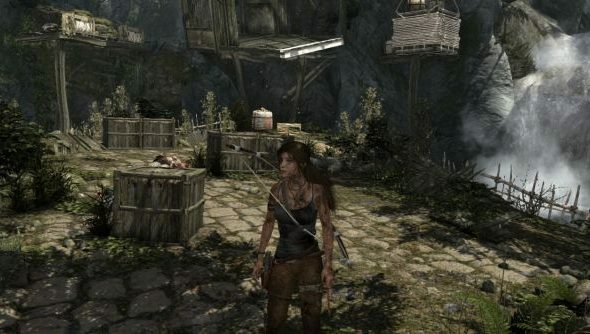 In Tomb Raider, Lara has to be stuck with rusty metal shards until Crystal Dynamics decide she’s had enough, basically. Fancy some of that? I notice that the quite-good Deus Ex: Invisible War is going dead cheap too.